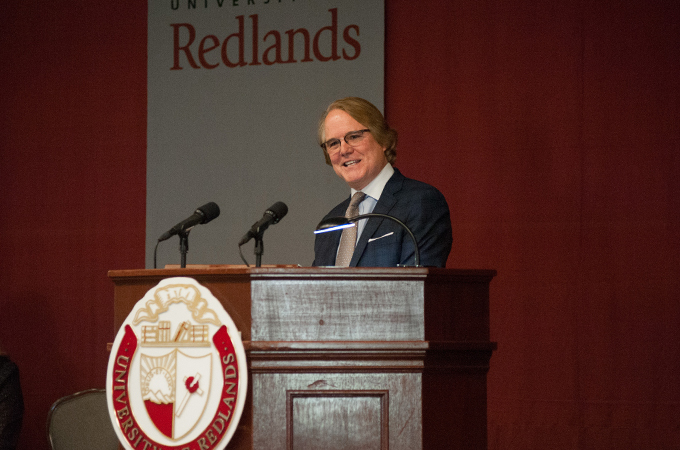 A ceremony last Saturday celebrated the installation of Thomas A. Horan as Senecal Endowed Dean of the University of Redlands School of Business. Below are excerpts from his remarks, reflecting on his vision and strategy for enhancing the school’s ability to make a difference. At the School of Business here at the University of Redlands … over the last several months we have made important strides. First and foremost, we have obtained our long-sought accreditation by ACBSP [Accreditation Council for Business Schools and Programs]. This 10-year accreditation validates the quality of our programs, and it is for this reason that we are very proud of our accomplishment. When I was asked to comment on this achievement at my first Board of Trustees retreat, I summed it up in one word—“Wahoo”! And I also thanked and now again thank our accreditation team led by Keith Roberts, who pursued this goal over several years. In my first few months, we have also launched new corporate partnerships such as with United Technologies Corporation, entered a new era of collaboration with Esri on Spatial Business as Jack [Dangermond, founder and president of Esri, a leader in geographic information systems mapping software] has noted, and created new pathways with premier feeder colleges. It has been an intense start, and yet it is just the beginning. As Al Pacino said in his memorable scene in Scent of a Women, “We are just getting warmed up”! As we get going, it is important to note that these are not scattershot actions, we have a plan and it’s a good one. In the spirit of the Olympics, we did what I call “luge strategic planning.” It began when I arrived, and over the last several months we have honed our mission, vision, and priorities. As part of this, we have met with all relevant stakeholders, conducted several retreats, examined our strengths (and, yes, our weaknesses), and wasted no time in looking for and seizing opportunities that will move us ahead over the next several years. Importantly, what has come out this effort is a renewed clarity about our mission. It is clear that we are here to empower our students to succeed in their professional lives and careers—and empower is a key word. For me, one of the most valuable activities I have done since arriving is meeting with our alumni and students to hear their stories about how they came to the School of Business at a point in their lives when they needed to finish that undergraduate degree or get that graduate degree to take the next step in their career or professional development. That’s why we are here. As I mentioned in my written reflection in the program, that’s our purpose. That’s our why. So, looking ahead, what’s our vision for the School? Building on 40 years of successfully providing liberal arts-founded business education, we now see our school as empowering our students through what we are calling “21st-century business skills.” These skills include the ability to be: integrative, collaborative, analytical, entrepreneurial, persuasive, ethical, global, environmental, and, yes, spatial in terms of understanding, analysis, and action—to be what Google Chairman Eric Schmidt has dubbed “the smart creatives” that drive business, and survey after survey of employers confirms the demand for this type of talent. Of course, we live in changing times. For example, recently, there has been heightened attention paid to automation and artificial intelligence (AI) and the jobs that could be eliminated due to these advances, including analyses by some of our very own business school faculty. There have also been analyses of what jobs will thrive in this new era. I recently attended a forum on a McKinsey report on this subject and was delighted to see that our 21st-century business skills are associated with the types of jobs that will remain in demand as we enter this new era. As such, we see our school as playing a critical role in developing this skilled workforce in the Inland Valley, throughout Southern California, and in new areas through our online programs. We are, after all, a Southern California business school with 1,500 students spread across seven campuses, as well as a network of 30,000 alumni. This celebratory setting is not the place for me to go into detail about our overall 21st Century Excellence Plan that encompasses five strategies and a full 23 actions devised to achieve this vision, but let me give you a sense of it. As alluded to above, we have a strategy (#1) for empowering our students to succeed through an integrated curriculum around these 21st-century business skills and a 360-degree view of student success and how we can support it. We have a strategy (#2) for enhancing the quality of our academic programs through new areas such as spatial business, organizational leadership, possibly healthcare management, and selective online degrees and certificates. We have a strategy (#3) to aggressively grow corporate partnerships and feeder school pathways, as they are key to our growth. The recent United Technologies Corporation partnership is a signal of things to come as several more major partnerships are in the works. We have a strategy (#4) to enhance our competitive infrastructure, both in terms of the “soft” infrastructure (such as faculty research support) and “hard” infrastructure (such as ensuring top-quality technologies in our classrooms and for connecting our regional campuses). And finally, we have a strategy (#5) for continually innovating in order to achieve programmatic and financial success. Indeed, out of all of this we are striving for gains in terms of both quality and growth; quality and growth are best thought of as synergistic—you really can’t have one without the other. But we are not an island unto ourselves; we do all this while appreciating our liberal arts foundation here at the University and recognizing how this foundation informs our distinctive business education. We see management as a liberal art, in that it requires both a broad understanding of the world and an ability to translate that understanding into specific and effective business and management actions. Since I have been here only a quick seven months, it is fair to say that we are just coming over the horizon (admittedly, rather briskly) and see a vista of where we are traveling to. I invite you to join us on the journey to our new vista. In the coming weeks and months, we will be reaching out for your insights and assistance in bringing our ambitions into reality. This can take many forms, from volunteering to the kind of support we have just received from Jack and Laura Dangermond at Esri. There’s a lot of work ahead, but we at the School of Business are excited to get on with it. To sum up, our school has and will be focused on making a difference: making a difference in the lives of our students and making a difference in the world. We believe that the purpose of organizations, including business organizations, is to deliver societal value, be it a better service, a more useful product, an impactful non-profit, or a well-run agency. That’s our calling here at the School of Business. 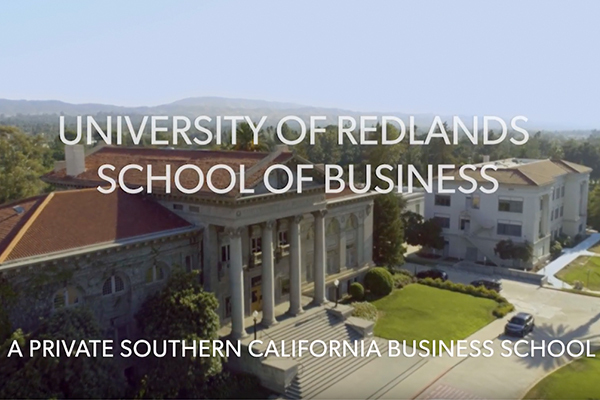 Learn more about the University of Redlands School of Business by watching the video below or visiting the U of R School of Business website.